As Alphabet, the holding company of which Google is now a subsidiary, steadily rises to join Apple and Amazon in the $1 trillion market valuation territory, we’re reflecting on all the moments in Google’s past that led to its position at the peak of industries as diverse as mapping, self-driving cars, and smartphone operating systems. This isn’t a comprehensive history of Google’s past 20 years. But it is an approximation of the company’s biggest product launches, legal quagmires, and instrumental acquisitions that have turned it into a Silicon Valley powerhouse that will likely last for many decades to come. Logo used from September 15th, 1997, to September 27th, 1998. Initially known as BackRub, Google began as a research project of Larry Page, who enrolled in Stanford’s computer science graduate program in 1995. There, he met fellow CS student Sergey Brin. The two stayed in touch as Page began looking into the behavior of linking on the World Wide Web. Page conceived a system that would crawl the internet to determine which pages were linking to other pages, positing that it could lead to the creation of a new kind of search engine. Together with Brin’s math expertise, the duo created the PageRank algorithm, named after Larry, to rank the search results based on linking behavior. The two technologies formed the foundation for the world’s most powerful search engine of its time, which launched on Stanford’s private network in August 1996. Inspired by the vast number of links between pages and how their search engine would only become more accurate and useful as the web continued to grow, Page and Brin renamed their company after the mathematical term googol (a one followed by 100 zeroes). The duo relocated to the garage of Susan Wojcicki, who would later become CEO of YouTube in Menlo Park, California. They incorporated the company as Google, with a $100,000 investment from Sun Microsystems co-founder Andy Bechtolsheim. 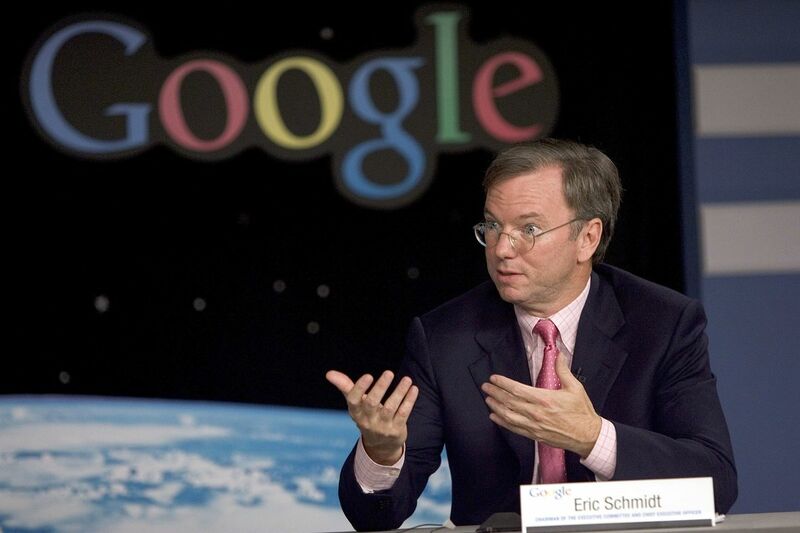 In 2001, Page and Brin recruited Eric Schmidt to run Google. The company was only a few years old, but it was rapidly growing and it needed guidance — or, as Brin said in a Charlie Rose interview that year, “adult supervision.” Schmidt had a seasoned background in engineering and worked as the CTO of Sun and then the CEO of Nortel before coming to Google. 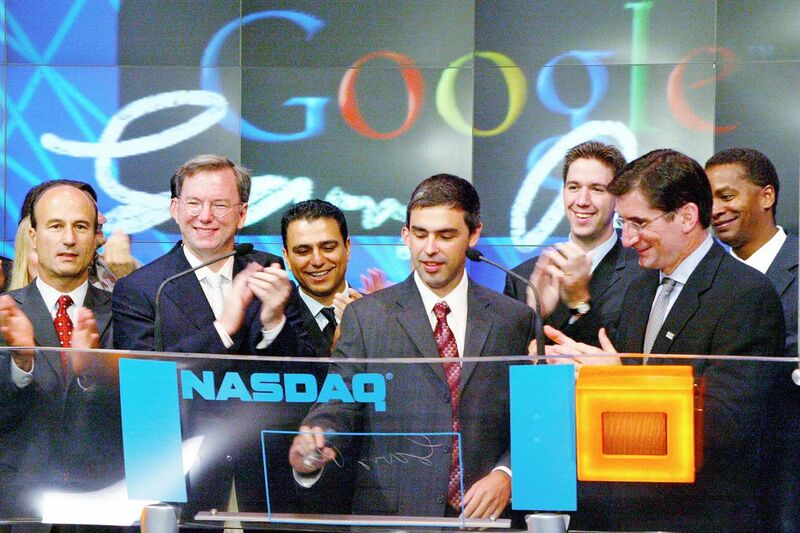 The early 2000s would prove to be big and defining years for Google. Long before Google became a verb, Yahoo was the premier internet search engine. As Google began to gain popularity, it even became Yahoo’s search engine provider in 2000. By the summer of 2002, Yahoo tried to acquire Google for $3 billion, but Google reportedly turned down the deal as it felt it was worth at least $5 billion. Google went on to launch Google News later that year, a content aggregation service that would change how digital media was published and distributed on the web. Today, Google and its parent company Alphabet have a market cap of $840 billion. Yahoo, on the other hand, sold to Verizon in 2017 for — ironically — just under $5 billion. Logo used from September 28th to October 29th, 1998. After outgrowing offices in Palo Alto and other nearby Silicon Valley locales, Google leased a complex of buildings at 1600 Amphitheatre Parkway, which was then known as the Amphitheatre Technology Center owned by Silicon Graphics in Mountain View, California. The move was designed to accommodate Google’s more than 1,000-person workforce at the time. It has since become known as the Googleplex, and it’s the company’s largest campus following multiple expansions and additional building acquisitions. In 2001, Google employee Paul Buchheit started work on an email product designed to address the company’s increasing internal communications and storage needs. Buchheit, having worked on early web-based email in the ‘90s, decided to build a faster, more responsive client using Ajax (then a nascent set of web development techniques that would allow the product to receive information from a server without having to reload the entire page). On April 1st, 2004, Gmail launched to the public with 1GB of storage and advanced search capabilities, dwarfing the limitations imposed by popular competing email products of the time, many of which offered just a few megabytes of storage. The release date led many in the media to speculate it was an April Fools’ prank. It was not. Following an initial investment of $100,000 from Bechtolsheim, Google subsided on a series of other angel investments, including one from Amazon founder and CEO Jeff Bezos. The angel investments precede a more formal $25 million funding round in 1999 from traditional Silicon Valley venture capital firms like Kleiner Perkins and Sequoia Capital. The company’s web advertising products made it hugely profitable, leading to an eventual initial public offering five years later. Google priced its stock at $85 a share, giving it a $27 billion valuation after raising close to $1.7 billion. Today, the company is now well on its way to becoming a trillion-dollar company. ”Maps can be useful and fun,” said Google when it first introduced Maps in 2005. The web-only renders provide step-by-step directions and zoomable maps with a smattering of businesses like hotels available to search. It wouldn’t be until 2009 when Google would roll out turn-by-turn GPS navigation for Maps on smartphones that things got really useful, but it wasn’t very much fun for incumbents like TomTom and Garmin. Logo used from October 30th, 1998, to May 30th, 1999. While Google had offered a Chinese language version of its website for users in China since September 2000, that service was based in California and was subject to blockades and firewall slowdowns. In 2006, Google launched a subsidiary based in China to more effectively compete with its local alternative, Baidu. Results were heavily censored with a disclaimer on top. After outbidding companies like Microsoft, Viacom, and Yahoo, Google bought YouTube for a tidy $1.65 billion. The deal was mutually beneficial for both parties: Google won the war for online video traffic, and YouTube — barely a year old at the time — gained access to Google’s hefty resources. The two remained in separate offices, however; Google’s headquarters were located in Mountain View and YouTube stayed put in San Bruno.The acquisition has proven to be one of Google’s most instrumental as YouTube has ballooned into a cornerstone of modern culture and online life, creating entire industries and kickstarting the careers of countless creators. Google established itself back in 2000 as a dominant force in web advertising with the launch of AdWords. That was the company’s proprietary and automated digital auction system that let advertisers instantaneously bid on top sponsored spots on its search results page every single time a user typed in a selection of keywords into the search bar. In 2007, having already launched its AdSense product that let website owners place contextualized and targeted ads, Google cemented its dominance in the ad industry with the acquisition of DoubleClick for $3.1 billion, which, at the time, was its most costly acquisition, second only to acquiring Motorola Mobility for $12.5 billion four years later. With DoubleClick, which specialized in display ads and ran its own exchange, Google further expanded its pervasive ad empire across the internet. Google hired several Mozilla Firefox developers, and together, they made Chrome for Windows, which later came to other operating systems. It was still a beta version, but it already had sandboxed tabs for faster and more stable browsing. Google made a 40-page comic explaining how Chrome worked to go along with the announcement. Over the course of four short years, Google’s browser had grown more popular than both Firefox and Internet Explorer. Ten years later, Chrome is now the world’s dominant web browser, with around a 60 percent worldwide usage share, and it’s the largest driving force keeping Google Search more relevant today than it’s ever been. Logo used from May 31st, 1999, to May 5th, 2010. After quietly buying Android for $50 million in 2005, what would become the most popular mobile OS in the world made its debut with the announcement of the T-Mobile G1 / HTC Dream, the first Android phone. Launched on October 22nd for $179 (with a two-year contract), they would go on to set the groundwork for the future with features that are still the pillars of the OS today: open software, deep integration with Google services, and best-in-class notification features. The early days of Android were dominated by a lot of weird experiments. Companies like Motorola’s Droid line, Samsung’s early Galaxy phones, and HTC’s Evo devices all (in theory) ran the same Android software, but Google’s design was often buried under ugly and confusing skins and lackluster hardware. Enter the Nexus One. It was built by HTC but designed by Google to be the ultimate showcase for what an Android device could be. And while the Nexus design has since fizzled out, that spirit has lived on in today’s Pixel phones, which have seen Google assert itself into the mobile hardware space more than ever before. At the start of 2010, Google discovered a sophisticated phishing attack in China on its infrastructure aimed at extracting the email addresses and personal info of Chinese human rights activists. The attack prompted Google to switch gears on how it was operating in China, even while knowing what a risky move it would be. Google.cn now redirected to Google.com.hk, an uncensored search engine based in Hong Kong. Soon after, Beijing banned Google from China. Logo used from May 6th, 2010, to September 18th, 2013. Oracle kicked off what would become an eight-plus-year and still unfinished lawsuit over Android that many fear could have disastrous implications for all software developers if Google were to lose. The case revolves around Java APIs and whether Google violated Oracle’s IP by reproducing them inside of Android. Without the ability to freely remake APIs, advocates like the Electronic Frontier Foundation are concerned that hardware and software development will be stifled. Google has won the case twice, only to have the ruling reversed in Oracle’s favor. Now, eight years later, Oracle currently stands as the victor while Google attempts to appeal to the Supreme Court. In 2010, Google rolled out a far different kind of product: a fleet of seven Toyota Priuses. The hybrid cars had been outfitted with sensors and loaded up with artificial intelligence as part of the company’s first crack at creating cars that could drive themselves. That effort would morph and evolve over the coming years and eventually become a standalone business known as Waymo. After launching a browser, Google set its sights on developing a whole operating system. Chrome OS was an open-source system designed mainly for hosting web apps and running on netbooks, now known as Chromebooks. At first, Google released its source code and then gave demos of the new OS. By June 2011, the first Chromebooks made by Acer and Samsung became available in retail stores. Chromebooks have since become a major force in education, and Microsoft has even followed Google’s lead with its Windows S Mode laptops. At the height of Facebook’s popularity, Google tried its hand at a social network with the launch of Google+, which replaced its Google Buzz microblogging tool. But unlike Facebook’s initial (and loosely enforced) policy of requiring collegiate email addresses to join, Google+ launched as an invitation-only network where you can share photos, links, and start Hangout chats with “circles” of friends. Keeping it invite-only for too long, however, was one of G+’s many downfalls. The network never really caught on, despite years of redesigns. The company was still tinkering with the layout and usability of Google+ as of 2017, but today, most user profiles sit as empty pages that come with your standard Google account for the company’s other services. No longer satisfied with leaving its “hardware” ambitions to partnerships with Android phone makers under the Nexus program, Google took a gamble when it acquired Motorola Mobility for $12.5 billion in 2011. The deal, Google said at the time, would “supercharge the Android ecosystem and will enhance competition in mobile computing.” In reality, it accomplished neither of those things. Under Google’s stewardship, Motorola launched the Moto X in 2013. Assembled in the United States, the Moto X offered an unheard-of level of customization and personalization options and intuitive software. Though well-received, it never caught on, and the successful low-end Moto G wasn’t enough to salvage this tag team. By the time the second-gen Moto X was announced in 2014, Google had already agreed to offload Motorola to Lenovo for a price that was billions lower than it had originally paid. And we all still miss Moto Maker to this day. Alongside smartphones and web services, Google also began working on experimental hardware under the Google X and ATAP divisions. The most famous product is Google Glass, a wearable computer that augmented information into your periphery and recorded videos and photos. To demonstrate the power of Project Glass, Sergey Brin showed off a live recording from a skydive at the company’s I/O developer conference in 2012. The device became available to developers and a limited group of waitlisted customers, but not before it was criticized as a potential privacy risk as several businesses began banning Glass-wearers from entering the premises. By 2017, Google Glass was rebranded as an enterprise product to narrow its focus, but the device did give way to other computer wearables such as Snap’s Spectacles and other AR glasses. ATAP would go on to build other notable projects including the Jacquard smart jacket and now-defunct Ara modular smartphone, while X span out as its own subsidiary that worked on moonshot projects. Logo used from September 19th, 2013, to August 31st, 2015. RSS nerds all over the world cried out in horror when Google said it would shut down Reader in 2013. The company showed real courage, the type Apple would later apply to the beloved headphone jack. Now, people get their “news” from Twitter and Facebook, resulting in a Donald Trump presidency and Brexit. Thanks, Google. The Chromecast started as a tiny, cheap, no-frills way of streaming video from a phone or computer to a TV. Five years later… literally none of that has changed, and Google has barely updated the product. But you know what? It’s still one of the cheapest and simplest ways to stream. DeepMind may have stumbled in its initial forays in the UK’s health care system, but it has since regained its step while also beginning to feed its expertise directly into Google systems, improving its speech synthesis tech and retooling its data centers to run more efficiently. Google is widely seen as the world leader in AI. It wouldn’t be so without DeepMind. August 10th, 2015: Google restructures as Alphabet Inc.
Google co-founder Larry Page decided to reorganize the giant conglomerate that Google became, thanks to its moonshots into a new company called Alphabet. The reorganization of Google — which, at this point, included the life-extending project Calico and the company’s investment arms — into distinct companies with their own CEOs and putting Sundar Pichai in charge of Google has worked extremely well for the company. Since the shift, new companies like Verily, Waymo, and Wing have launched under Alphabet with dedicated organizations that are solely focused on their success, something that likely wouldn’t have been possible under the single, very crowded, umbrella the Google had become. To commemorate the reorganization, Google unveiled a new logo one month later on September 1st, 2015. Current logo unveiled on September 1st, 2015. Google may have been the last to launch a virtual assistant, reaching the market two years after Amazon’s Alexa and nearly five years after Apple’s Siri, but it has nearly caught up with both of them. Google Assistant has rapidly grown to compete directly against Alexa for consumer-facing AI dominance, it powers Google’s Home speaker, and it became available on a number of speakers, TVs, and smart displays in less than two years on the market. If AI is the future, Google has positioned its Assistant as a legitimate challenger to Alexa’s consumer throne. Following its years of dabbling in consumer hardware with its Nexus program and other one-off devices, Google jumped into the deep end with the launch of the Pixel and Pixel XL smartphones and Google Home smart speaker. The Pixel was the first proper Android smartphone designed entirely by Google. Although it was still manufactured by a Google partner (in this case, HTC), it marked a bold shift for Google toward a cohesive, Apple-style product ecosystem. The Home speaker has since joined the Chromecast as part of Google’s media and artificial intelligence platform for the home, while the Pixel line has arguably become the gold standard for flagship Android handsets. Six years after testing its first autonomous cars, Google decided to spin the project out into a standalone business. Called Waymo, the new company was led by former Hyundai CEO John Krafcik. Crucially, it also partnered with Fiat Chrysler and began using Pacifica minivans as its vehicle of choice — leaving behind (for now, at least) Google’s original plan to build a self-driving car from the ground up. Google’s years of testing and deep pockets put Waymo on the proverbial fast track when it comes to self-driving cars. The company is already testing out offering rides to real customers in Arizona, and it plans to fully launch a commercial service in 2018. 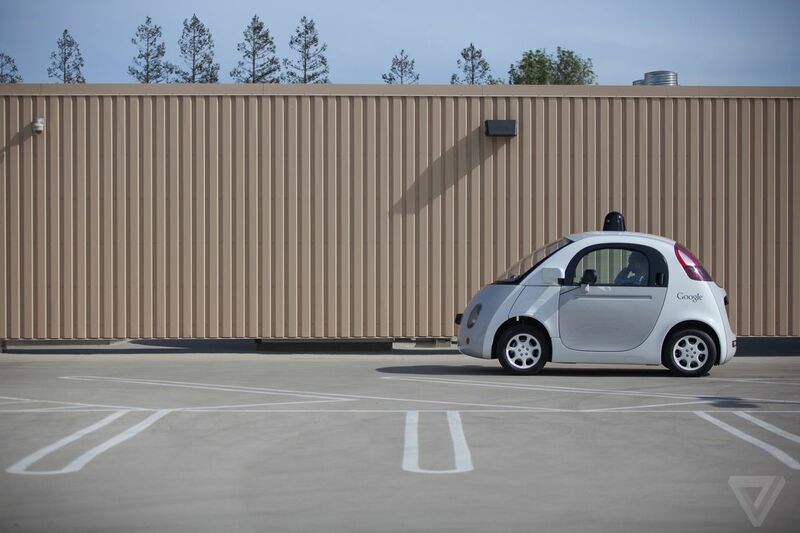 Waymo remains one of the original Google X lab’s most successful ventures. Google’s reach and influence in today’s world is so categorically unparalleled in modern business that it’s understandable that the company has faced a number of legal challenges over the years related to privacy and anticompetitive practices. 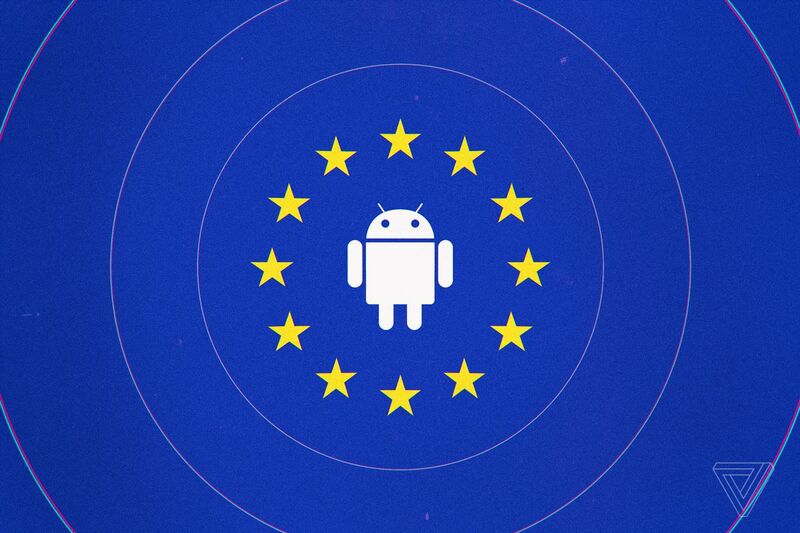 But none were quite as forceful as this past summer’s $5 billion fine from the European Union for alleged Android antitrust violations. The EU’s regulatory body, the European Commission, determined that Google was prioritizing its own shopping service in ads displayed in the Chrome browser, which is preloaded by default on most Android smartphones. Although largely seen as a slap on the wrist that comes too little too late, the fine is part of a larger realization from policymakers and the public that Google, and its fellow Silicon Valley giants Facebook and Amazon, may have long since entered into monopolistic territory. Just one month after the fine, US President Donald Trump accused Google of manipulating search results to censor conservative news outlets. Google likely has many more legal challenges ahead as it continues to grow far beyond the Stanford research project it started as 20 years ago.